It is over 40 years since a Newport doctor’s practice hit the national headlines. The furore blew up because at the time unsightly telegraph poles were not allowed on council estates, and the St Julian’s Practice started up by Dr. John E. Lloyd was refused planning permission for a telegraph pole outside the surgery. It became known as the ‘practice without a phone’ but after the local and national press stepped in with headlines like ‘No pole, no doc!’ all became sweetness and light and a phone was installed. Permission had been granted to develop a new general practice in the St. Julian’s area and Dr. Lloyd rented a council house in Worcester Crescent but within two years the facilities proved inadequate and a new house was built in Beaufort Road, St. Julian’s. Dr. David Davies had by now joined the team to meet the demands of the new practice but accommodation was often so inadequate that patients sat on the grass outside to wait their turn. It was decided to move once again, this time to 213 Caerleon Road and even larger facilities. Growth continued and the practice welcomed Dr. Bernard Palmer who had returned from Canada. By the 1980’s a lady doctor, Dr. Saleh, had joined the practice and with the arrival of a Practice Manager and the installation of a computer system, the practice at 213 Caerleon Road was literally going through the roof! Retirement was fast approaching for the two elder partners and the younger partner, Dr. Simon Price, began looking for larger accommodation. Previously, the old St. Julian’s Clinic controlled by the local authority had only been available for rental, but with changing political attitudes the site in Stafford Road became available for purchase. The post war hangar-type building was demolished and made way for a large purpose built multi-function clinic to carry on the traditions of the Caerleon Road surgery. Dr. Graeme Yule joined the practice at 213 Caerleon Road in August 1992 and Dr. Ray Monsell in February 1993. 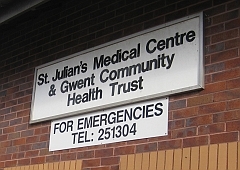 Dr. Janet Evans joined St. Julian’s Medical Centre in August 1995, Dr. Malcolm Brown in January 2001, followed by Dr. Rhodri Evans and Dr. Rebecca Hunter in 2012.